"Un bon croquis vaut mieux qu'un long discours." 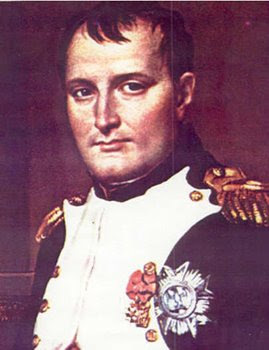 Napoleon Bonaparte is one of the greatest military and political leaders of history. He was a general during the French Revolution, the ruler of France as First Consul of the French Republic, Emperor of the French and King of Italy under the name Napoleon I. He is also remembered for establishing the Napoleon Code, which laid the bureaucratic foundations for the modern French State. FW : Below I put 1994 Pulitzer Prize winning photo. 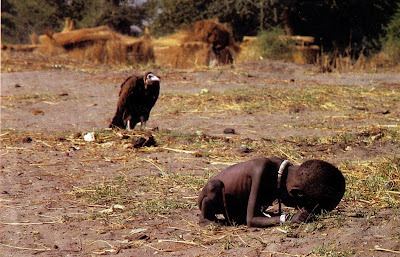 Kevin Carter, the photographer, committed suicide three months after receiving the prize. A picture is worth thousand words, isn't it? tears overflowed when i saw this picture....i cried for the child.the pic is heart wrenching! What a heart breaking picture! It sure puts life into perspective. Never knew who said that quote even though I use it a lot - Thanks! People including me should feel shame after seeing such photos. This kid also came to earth with lots of desires and live long in this earth. go for war and utilize funds for buy weapones.... we are shameless people.. I studied history in high school and we did spend a whole term talking about Napoleon and his shinanigans...but on another note, the photograph of the poor child is heartbreaking. It brought tears to my eyes. Not sure I'll be able to sleep tonight after seeing this. The whole thing is horrible. This isn't heart-wrenching, it's disturbing. The child, and there are so many in this world in the same situation. And then to learn how this clearly affected the photographer. The only one who saw any good out of this was that vulture! Ugh! So disturbing! That poor little guy. Have seen it before and had to grab my box of tissues. Just dropped by to say "hi" via Entrecard. Yes, a picture is certainly worth a thousand words! Wonderful but disturbing picture of the child. Nice blog! Congrats on the I LOVE YOUR BLOG award. I was so saddened to see this photo, I went to search for more info about it. Turns out the photographer was a fellow South African! Maybe one day all this suffering will stop - if everybody does a small part to help. I remember when that pictures was published in one of the major national news magazines. I was at work, it was on the lunch table, and one of my co-workers started laughing at the photo. I was beyond stunned. I lost my appetite and left the table. I wanted to smack her into the next week, but she was a friend. I am much more selective as to who I call "friend" now. That photo should stun us to silence, perhaps cause a tear ... although I suppose I should give folks the benefit of the doubt. Perhaps laughter was her way of dealing and coping. This is such a sad picture.It is definitely worth a thousand words.